With warm weather just a month or so away, it may be time to take a look at a game with that right Summery mind set. 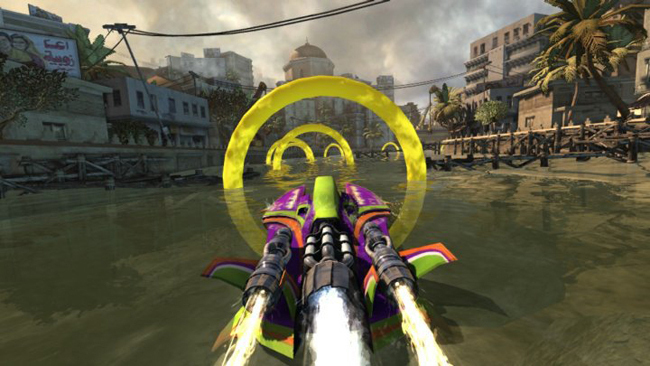 Hydro Thunder Hurricane is an XBLA game set to be released later this year. I had a chance to get Creative Director Matt Small to take some time away from completing development on the game and answer a few of our questions. Toby Davis: How and why was Hydro Thunder Hurricane picked to be your first game under the Vector Limit studio? Matt Small: Ralf Knoesel (our Technical Director and lead programmer) and I are big fans of water-based games. We love the original HT, Wave Race 64 in particular, and at Stormfront Studios we led the team that developed Blood Wake on the original Xbox. 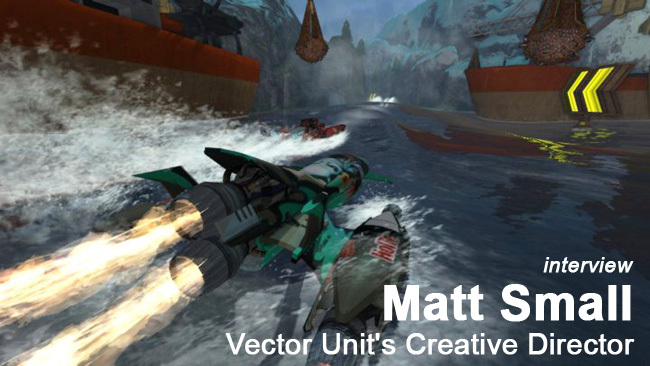 When we started Vector Unit, we decided to kick the company off with a new speedboat racing game that captures the spirit of those old games, with the addition of all the amazing new things that you can do with water physics on new consoles like the 360. 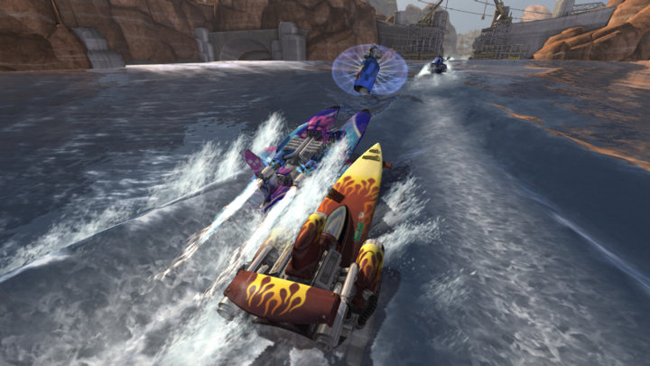 We pitched the game to Microsoft for XBLA, and during our talks with them the idea came up of making the game into a full-featured sequel to the original Hydro Thunder. TD: There are minimal customization options in this game, whether with the vehicles or any level editors. Why was this left out? MS: We decided to focus all our efforts on making the boats and levels feel balanced and exciting. At various points we considered options for customizing boats or user-generated tracks, but ultimately we felt that it was more important to present an accessible, hand-crafted experience that players can just jump into and have fun with. TD: What is some of the inspiration behind your background sounds or music choices for the game? MS: Each environment in the game tells a kind of story, and the background sounds are there to enhance the story, add excitement, and bring the world to life. The music in the game is all original – it has a modern techno feel with a driving rock and roll base. TD: With the game is coming out as an XBLA title, will it support Natal controls when Natal is released? MS: We’re very excited about the prospects of Natal, but for an arcade racer we felt that it was more important to focus our attentions on tuning the regular Xbox controller to perfection. However, because we are racing fans we also are including support for the Xbox 360 Wireless Racing Wheel peripheral, and we’re happy with the implementation – the feedback on the wheel really helps you feel the boats carving into the water. TD: Will there be any references in this game (a la Easter Eggs) to the original, or to any other games? TD: During the development so far, what has been one of the best moments for the team? MS: The PAX East show in Boston in March was one of our high points. It was the first chance we had to show the game to the outside world. We were particularly gratified to show the game to fans of the original Hydro Thunder games; it’s been really important to us to capture the spirit and fun of the original game, and the feedback from fans who have had a chance to play the game has been overwhelmingly positive. TD: When making this game what are you trying to accomplish as a developer? MS: One of our main objectives was to show that you can deliver a great arcade racing experience on XBLA. Our company motto is “big games in small packages”: We want create small downloadable games that capture the same level of fun, graphical polish, and intensity of a full retail game. I think we accomplished our goals with Hydro Thunder Hurricane — I’m very proud of the game, and I think once players get a chance to download the free Trial on XBLA, it’ll make a big splash.